Florida Gov. Rick Scott declared a state of emergency in some counties due to the red tide outbreak. One Florida county has dumped more than 17 tons (15,420 kilograms) of dead fish collected since red tide algae crept up from South Florida into Tampa Bay. Fish are dying off at such a rate that officials are seeking more commercial vessels to sift dead sea life from the Gulf of Mexico and haul it to a landfill. 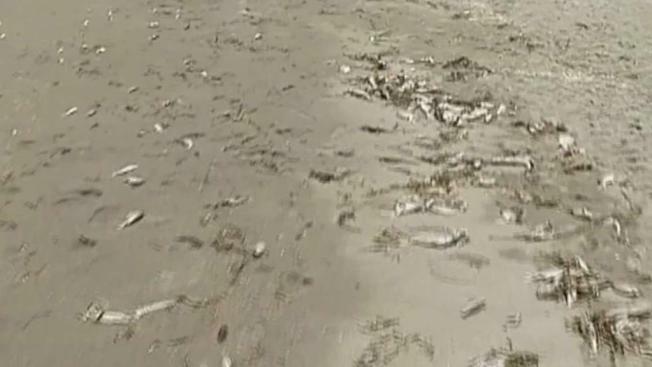 Onshore in Pinellas County, many beach businesses say they aren't seeing dead fish and that tourists are getting spooked away despite clear waters. The last red tide report out of the Florida Fish and Wildlife Conservation Commission on Friday said the bloom was still active in Southwest Florida and extended from Pinellas south to northern Collier County, a stretch of about 120 miles (193 kilometers) of coastline. The lack of dead fish along the shore is at least partly because the county has been paying boat captains to capture the carcasses before they reach the shoreline, the Tampa Bay Times reported. "This is massive," said Kelli Levy, Pinellas' director of environmental management. "We are ramping up." From Friday through Monday morning, the county landfill received 17.35 tons (15,740 kilograms) of dead fish, Levy said. Currently, two shrimp boats and three other pieces of commercial equipment are being used to collect the fish. But it is not enough. Contractors are being asked to bring in more equipment, including large beach rakes. The rust-colored bloom could be seen from the air off Redington and Madeira beaches on Monday afternoon. Curt Preisser, the Madeira Beach city spokesman, said the town was prepared for the bloom to spread. Officials first noticed it was 5 miles (8 kilometers) off the coast on Friday afternoon. "But it's a big bloom," Preisser said. "And we're not getting all of them." The fish getting through to the shoreline are being raked up once they reach the beach. Madeira had cleared up much of them by 10:30 a.m. Monday but continued work through the day as the smell of fish lingered in the air. Just south, Treasure Island was experiencing similar conditions. Workers there collected fish manually over the weekend and loaded them into a "hopper," or portable containers the size of a dumpster.